Welcome back for part five of my of my weekly blog posts on my journey to becoming a personal trainer. 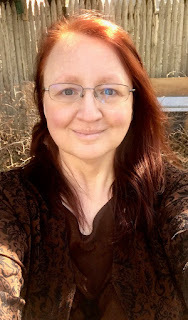 Today I'm going to talk about Week Three and how I'm handling it. Week three honestly wasn't as hard as week two. 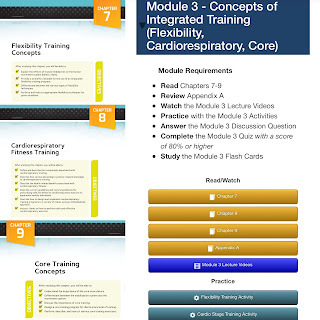 It was still difficult and time consuming (my discussion question alone took me over three hours to write and edit) but there were less muscles to memorize and it focused more of various exercises for flexibility, cardio and core training. 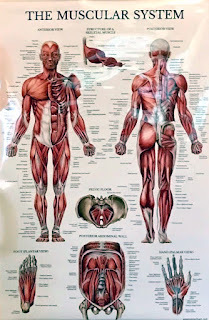 The biggest amount of muscles to worry about was in the core section where we have to learn all the muscles of the core. I'm still working on that part but I did mnemonics for it the way I did for the assessments and it's helping but just the mnemonics aren't enough any more. They were a good start but I still need to learn and understand all the muscles and their functions, not just have a basic idea of what they are. 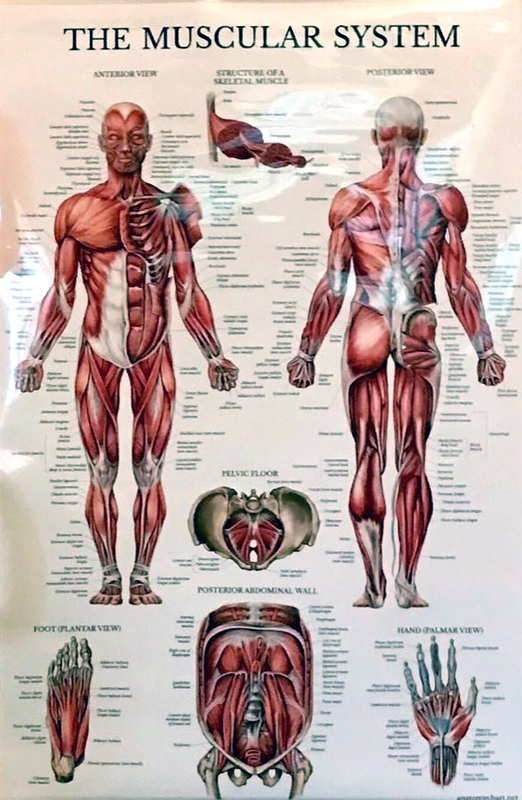 I ordered a laminated poster pf the muscles of the human body and hung it up on the wall where some of my motivational workout posters used to hang so I can see it from where I sit and study and that's been really helpful! And just like with the assessments, I found images of the different core muscles and split them up into the three sections I need to know in my study guide so I can see all the muscles of each section on a separate page. The other thing I did this week was go through every quiz I've already taken (and am still taking), review every question and answer and add whatever I don't know yet, have questions on or am getting wrong as notes in my study guide. It's a lot of extra work but it'll be worth it in the end so that everything I need to know is right in one guide at my fingertips! I can honestly say I'm glad I did my research and had some idea of what I was getting into before just jumping into it because it's taking up almost all of my time. 90% of my day is spent working on this program but I was expecting that so I'm good with it. The biggest thing I need to get done outside of studying and reading and doing quizzes and discussion questions and more studying and reading over and over and over again is get back to the gym already! What's the point in learning to be a personal trainer if I'm not working out? I WILL be back on Monday no matter what and I'm ready to get going with that. Plus I can watch NASM videos on my phone while I do cardio lol. I now have 68 days until my exam so I'm going to get back to my study guide. I've finished all the Module 3 assignments (and did really well on them) and have started work on Module 4 which seems pretty close to what Module 3 was, but I'm also still processing the info from the previous modules so there's still a lot to learn, old and new information alike! Next week is the mid-term and I'm actually looking forward to it because it'll give me a week off from working on the next section of my study guide! So... back to studying I go!